The Infectious Madness of Doctor Dekker landed on PC in May of last year, where it received highly positive user reviews. Now Wales Interactive has published the title on Xbox One, PlayStation 4, and Nintendo Switch. It's part of a recent trend of FMV (Full Motion Video) Steam releases, a genre that hasn't been this popular since the early-to-mid 90s. If you're wondering whether the FMV genre has improved since those days then the good news is that it definitely has. In this particular title you take on the role of a psychiatrist who is the replacement for a recently-murdered Doctor Dekker. Your job is twofold: to treat and try to cure all of his patients, and to try to solve the case of who murdered him (I ended up being awful on both fronts and I’m pretty sure I accidentally made two patients commit suicide). The game randomly selects a killer from a number of the late doctor's patients, and depending on who the killer is you’ll witness various different scenes. Each of the patients is superbly acted and genuinely convincing. Their stories are also engaging and deep; I was left constantly doubting myself when I thought I knew who the killer was. There’s a Lovecraftian element to the game, too – one of the patients, Marianna, wears a Cthulhu necklace but wouldn’t seem to break her silence on the matter when I quizzed her. Another patient, Nathan, lives in a 'loop', living the same day over and over again. In a nice touch he's the only patient who doesn't change his clothes over the entire course of the game. Each day you'll chat to the patients, asking questions and taking on board their answers so that you can further delve into the mysteries surrounding them and the death of your predecessor. As you progress - and depending on how you look at things - your character either begins to slip into insanity or becomes more attuned to the paranormal (something that's a pre-occupation of all of the patients). If you find yourself starting to believe them then you’ll find that your character descends into madness, seeing things that aren't there and 'gaining' insanity points. Now, asking questions might sound like a tedious task on a console, where typing out words is a chore, but the game allows you to use companion apps for Smartglass and Second Screen to mitigate this. You can also plug in a keyboard, which I found to be the best option. Failing that, there’s also a suggested questions list, which more or less covers most of the questions likely to pop into your head. Another likely area of concern is that if you venture too far away from the suggested questions, or ask something the developers hadn't considered, then you'll be hit with one of a number of stock responses. To some degree this is to be expected from any game that allows the player to directly ask questions, but I must say that it did happen to me a lot more often than I expected it to. The Infectious Madness of Doctor Dekker's length fluctuates wildly based on the questions you ask and the avenues you investigate. For some it will probably take just a couple of hours to beat, but they'll miss out on a lot of patient back-stories and other details. Compared to the genre as a whole, however, it's really quite lengthy. In fact it currently holds the Guinness World Record for most FMV in a video game, with a total of over 1,600 separate scenes recorded. The Infectious Madness of Doctor Dekker takes a great stab at presenting a modern FMV murder mystery game. It's well-acted and there are lots scenes to explore, so despite falling into the familiar pitfalls of the genre it still kept me hooked through the night trying to figure out who the killer was. 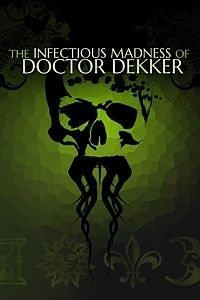 This review is based on a digital copy of The Infectious Madness of Doctor Dekker for the XOne, provided by the publisher.